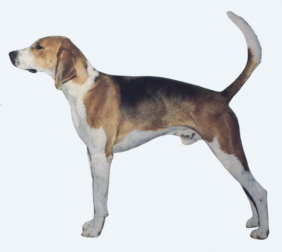 My ancestors were English Hounds and Kerry Beagle hounds (from Ireland). I'm quite independent and have a strong will, and I am an excellent pack hunter. I have long ears, a lean structure and a close, hard coat which can come in lots of different colors -- but mine is tricolor, which you will probably see more often than any of the others. Sometimes I have problems paying close attention to what my owner wants me to do, because I prefer to do my own thing. When fully grown, I am between 21 and 25 inches tall (53.3 to 63.5 centimeters). � 1996 - 2008 Dogs4Sale.com. All rights reserved . Photo � 1996 - 2008 TATM Comunications All rights reserved. Used under written license. We have no American Foxhound Breeders listed at this time. Click here to place your American Foxhound Ad!